Our nation’s first national park is known for spouting geysers, plunging falls, and an abundance of wildlife. 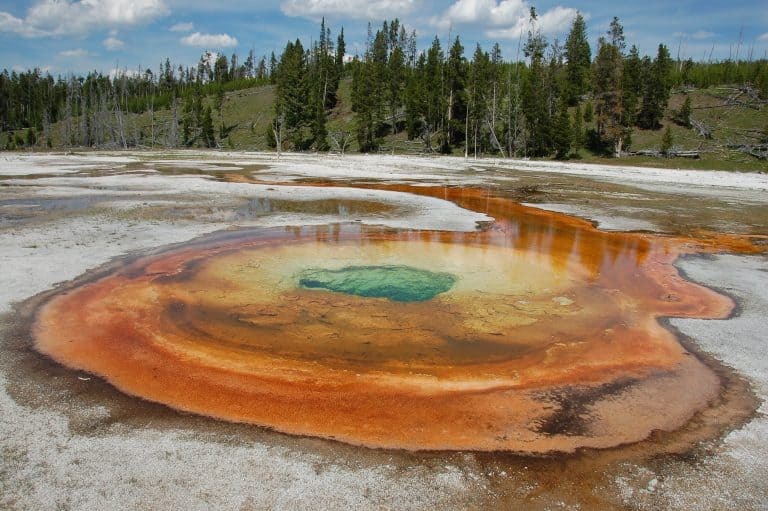 Most see Yellowstone by car, but there are actually several great hikes in Yellowstone National Park of ranging levels of difficulty. Yellowstone is a massive park and these five hikes were chosen in part for there amazing scenery, kid-friendly level of difficulty, and to show off the incredible diversity that the park holds. It may sound a bit odd to those who haven’t experienced it, but there is something mesmerizing about the splitter splatter of hot bubbling mud. The 1-mile hike starts on a boardwalk that leads you through a burn area from the fires of 1988, then heads over to the pots of gloppity goop. The sound of the popping and sputtering coming from the mud pots, along with bubbling spectacle that they create, entranced me and my kids. My husband literally had to drag the three of us away from the area. Sometimes the mud pots get a little over zealous during their splatter filled show and specks of mud fly up onto the boardwalk. I had a couple wild specks land on my shorts and gladly wore them as a badge of pride for the rest of the trip. Join the crowds and complete a Yellowstone right of passage by watching the predictable eruption of Old Faithful, then head out on one of the trails that loop around the Upper Geyser Basin towards Morning Glory Pool. 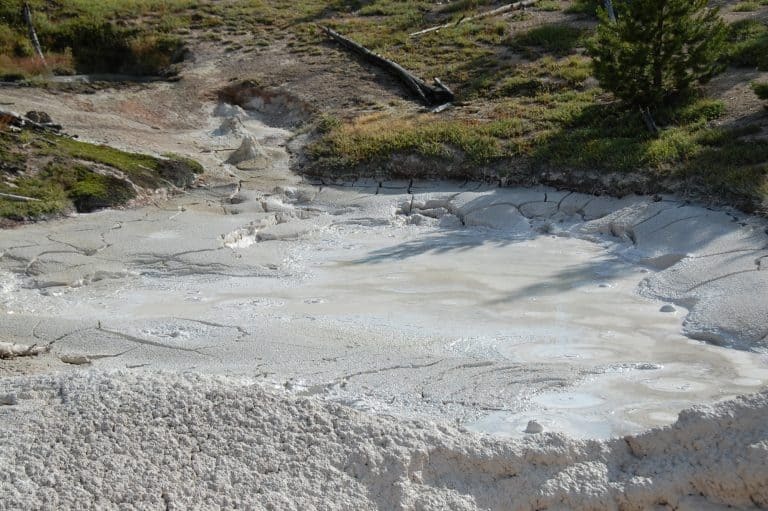 The Geyser Hill (1.3 miles RT) and Observation Point Loop Trails (1.1 miles RT) will get your family up close and personal with pristine geothermal pools and the grandest of geysers. Some geysers erupt at fairly regular intervals such as Daisy, Castle, or my personal favorite, Riverside; while others tend to go off with no predictable timetable. Make sure to keep your children on the trail. The pools may be stunningly beautiful but many of them are also boiling hot! 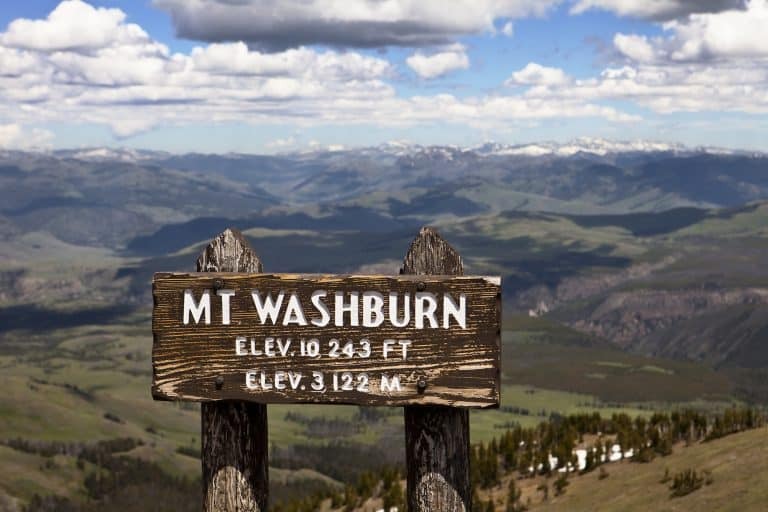 Make no mistake, the hike to the top of Mt Washburn is no tip toe through the tulips. The hike is 6 miles round trip and gains over 1300 feet in elevation on the way up, but the rewards are well worth the hike. During the summer Mt Washburn is a wildflower wonderland, with over 50 different types of wildflowers growing along the mountainside. Bighorn sheep frequent the upper regions of the trail along with marmots, bears, deer, and the elusive pika. The view from the trail is incredible, making it one of the best hikes in Yellowstone National Park. On a clear days hikers can see the Grand Canyon of the Yellowstone, Yellowstone Lake, the Grand Tetons, and even an eruption of Old Faithful. Most people have never given calcium carbonate much thought, let alone any appreciation. 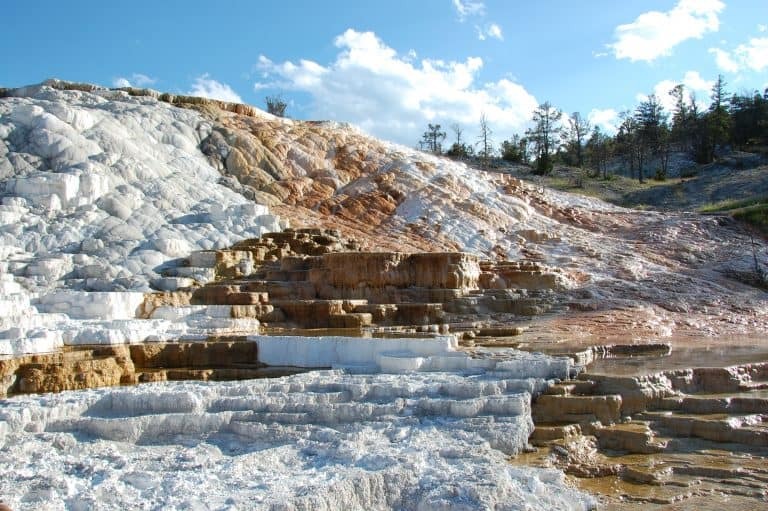 After your family spends a couple hours touring the boardwalks traversing Mammoth Hot Springs, I have a feeling you will be all singing calcium carbonate’s praises. Almost 2 tons of the stuff comes spewing out of approximately 50 hot springs which make up Mammoth Hot Springs, creating gorgeous travertine terraces in the process. The scenery around Mammoth Hot Springs reminds me of a cross between an ancient Grecian palace and an alien planet. The travertine itself is stark white but the algae living in the pools have tinted it shades of orange, brown, and red. My kids had a blast climbing up and down stairs and running around the boardwalk (total walking distance 1-2 miles depending on your route) to get a better look at the formations around the springs. Yes, you can get an amazing view of both Upper and Lower Yellowstone Falls from Artist Point or Lookout Point, but to truly be amazed by the sheer amount of water flowing over the falls on a daily basis, head down the Brink of the Lower Falls Trail (a short but steep 2/3 mile RT) and be blown away. 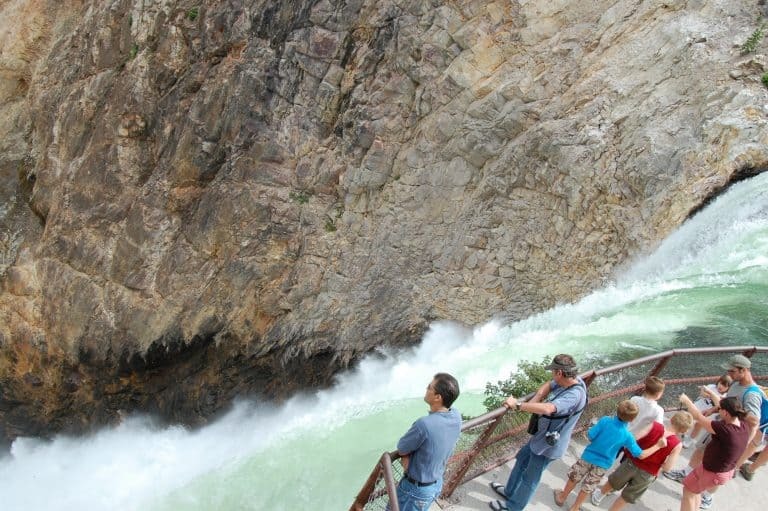 This trail is nothing more than a series of switchbacks leading down to an observation platform at the brink of the falls, but watching the rushing Yellowstone River plunge 308 feet over the edge certainly took my breath away! Need help encouraging your kids to make the climb back up? Have them count the switchbacks and tell them if a two-year-old can do it, so can they! I have been looking for some inof on hikes with kids in Yellowstone!!! Thanks… how about Glacier!!! Is it possible to hike Coyote Falls Goulch UT with a 5 year old? Going to West Yellowstone and beyond this August. Crowd haters looking for breathtaking views and experiences to remember.